An extract from the August 1909 Holy Trinity Parish Magazine. Featuring the choir excursion to the Lathkill Dale in Derbyshire. We had our choir Excursion on Friday, July 23rd, rather earlier than usual. We left Southwell by the 8.38 a.m. train, and travelled to Rolleston like ordinary people. But, there, when the Nottingham train drew up, we found that a Pullman Car had been reserved for us -- a type of carriage that is disappearing, but which runs more smoothly than the ordinary third-class saloon. We reached Rowsley about 11.20 and found conveyances awaiting us to take us to Alport, where we had a hot dinner, to which we did full justice. Then we started for an expedition up the beautiful Lathkill Dale, walking for about 2 miles. We should have liked to reach the village of Over Haddon, which looked down upon us from its height, but we were limited for time. Returning to Alport, we had a good tea, and then we drove back to Rowsley to catch the 5.36 train, Southwell was reached at 8.29. There was a shower of rain as we were finishing dinner but otherwise the day was beautifully fine. Mr. A. B. Gill planned the Excursion, it was generally allowed, was quite up to the average, which was high praise! 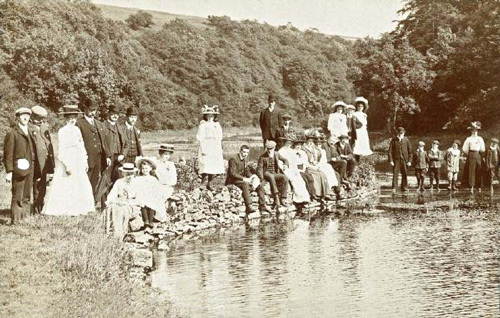 A very successful photograph of our party was taken by Mr A. J. Loughton at the most beautiful spot in the Dale. The postcard above, was posted from Southwell on 6th August 1909 to an address in Manchester. One of the comments in the message is "This is the place where the Choir went last Friday you will know some of them".